I’timaar offers cheap December Umrah Packages, so you have a wonderful opportunity to perform Umrah in the month of December at the most attractive prices. Now you do not have to worry about the harsh weather because Makkah and Madinah remain quite comfortable in this month. The weather is cool with no humidity and wind. Complete all your rites comfortably and without any hurdle under the favorable weather conditions. Our exclusive group Umrah December 2019 packages are best for you if you are planning to travel in a group. It will also cost you much less in comparison to travelling alone for Umrah. You can also take along your families and loved ones on this spiritual journey of Umrah with our Family Umrah Packages for December 2019 at affordable rates. With Christmas and New Year holidays in the month, it is the perfect time to travel to Makkah for Umrah and make use of this period in connecting to Allah (SWT). It is also easy to get away from work and take time out for travelling, so why not avail this opportunity to go for pilgrimage! We understand the importance of your Makkah trip and that is why we ensure that our customers get the ease and convenience while travelling for the pilgrimage so that they remain stress-free and be able to focus completely on Ibadah and spirituality. Whether you wish to perform Umrah individually or with your family, our December Umrah package deals include the flights, accommodation near Masjid-ul-Haram and Ziyarat of all the Holy Places. With proximity to the Grand Mosque, it will be easier to reach the Mosque on time and complete all the Rituals of Umrah without any hurdles. You can visit the Holy Mosque to pray any time you want. With our strategic pricing scheme of Umrah packages for December, you will be able to choose the one that perfectly suits your budget. 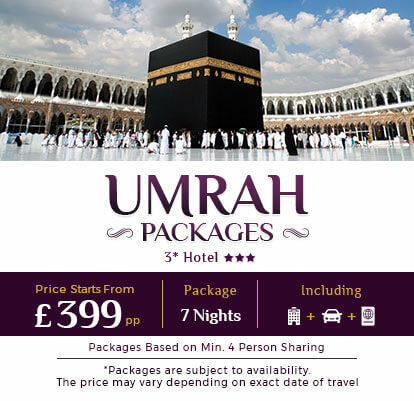 Choose from our special 3-Star, 4-Star or 5-Star December Umrah packages 2019 from the UK that are available at attractive prices. Our team of experts is available 24*7 for your convenience and to ensure that you have a smooth and hurdle-free journey. With an extensive experience in planning Hajj and Umrah tours, we take care of every single aspect of your Ziyarat providing world-class services, so that your spiritual journey remains joyful. Call our customer executives today to learn more about our December Umrah packages 2019! Umrah is a spiritual obligation that every Muslim dream of performing at least once in life by visiting to the sacred city of Mecca. December Holidays on the occasion of Christmas and New Year’s Eve prove as a blessing for Muslims who can use this time to perform Umrah. The weather is quite pleasant in Saudi Arabia which only adds to the reasons for it being a favourable month for performing Umrah. Take advantage of this period by scheduling your Umrah with your family or a group of friends with our best December Umrah deals. I’timaar brings exclusive and the most affordable December Umrah packages 2019 for UK citizens in the category of 5-Star Umrah, 4-Star Umrah or 3-Star Umrah packages which matches exactly to your needs and budget. Muslims from Manchester, Birmingham, London, Bradford and many other places within UK can avail these packages and even customize according to their requirements by choosing their desired hotels and airlines. Registered with ATOL, we are the most trusted air travel organizer in the UK that has developed a distinctive reputation in the industry for sending UK based Muslims to Saudi Arabia for Umrah. 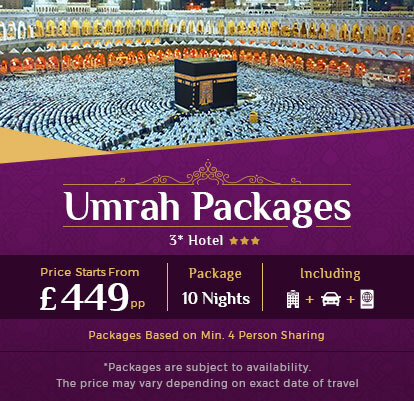 You can select direct or connecting Umrah flights from UK commencing from London Heathrow, Birmingham or Manchester airports. Heathrow is the most popular airport point for pilgrims leaving for Mecca and Medina. Pilgrims are offered comfortable accommodation in the top hotels of Makkah and Madinah preferably near to Haram and Masjid-e-Nabawi. Our Umrah agents help you get the visa, transport and meals for your journey ensuring that you get all the facilities for a hassle-free and comfortable Umrah trip. Also Read: How to Wear Ihram for Hajj/Umrah? Get the best facilities and world-class amenities in our December Umrah package deals at the most affordable prices. Savour your Umrah experience by booking your package with us and securing the nearest accommodation near Haram and Prophet’s Mosque. Our exclusive 5-Star Umrah Packages reserve you the best luxury hotels including Swissotel, Pullman Zamzam, Makkah Hiton Tower and Millennium Al Aqeeq at the lowest prices. You get well-furnished, luxurious and decorative rooms for a comfortable stay and a memorable Umrah. By providing direct flights to Makkah & Madinah, we make sure that your Umrah journey remains relaxing and hassle-free. Taste the best Arabian food from in-house restaurants in our reserved 5-Star hotels. Our travel agents are available round the clock to answer your queries and help you perform Umrah in the best manner. Secure our best Umrah deals at the most affordable prices. With our 4-Star Umrah Packages, we provide the best facilities with hotels within the proximity to Haram and Masjid-e-Nabawi. With our dedication to serving you in the best manner, our hotels are also near the marketplaces to provide a level of comfort and make sure that all your needs are met. By availing our Umrah packages you secure the best facilities at the lowest prices. Our packages are best suited for those who like to travel with groups. Make the best of your December vacations by going for Umrah with your family and loved ones. With our low priced Umrah deals, we focus on providing ease and comfort during your travel. Each passenger is given special attention and their needs and requirements noted and fulfilled during the Umrah trip. If there is an elderly person in the group, we provide wheelchairs for their comfort so that their journey is less tiring and more fulfilling. Without compromising on quality, our special 3-Star Umrah Deals for December give you and your entire family a chance to visit the holiest mosques in Mecca and Madinah to perform Umrah. With our best-priced deals and Umrah packages, take this chance to transform your life spiritually by visiting Baitullah (The House of Allah). It is a good idea to book your Umrah package in advance to save money but we also have last minute deals where you will get the most cost-effective offers for travelling to Makkah for Umrah. With easy access to the marketplaces, you can get flavoursome food at low prices during your Umrah tour. Our 3-Star packages are perfect for those who want to perform Umrah within budget. Pilgrims get accommodation in good hotels with quality room service. We assure you that our Umrah packages are equally accommodating in terms of quality. Travel with your whole family to Makkah for performing Umrah this December by availing our December Umrah deals. We remain focused on maintaining and delivering all your requirements within your Umrah budget. In our effort to help customers in every step of their Umrah journey, we have a strong team of customer support professionals to assist them. In case of any issue or query related to Umrah packages or your Umrah trip, you get prompt assistance through the online chat support on our website or through phone. As soon as a query is received online through chat or email, our customer support team swings into action. Our travel experts work together to ensure that the customer's query is answered and the issue is resolved without any delay. You can be assured of having complete assistance on all aspects of Umrah, whether it is the booking of your Umrah Packages or informing you about Do’s and Don’ts of Umrah. Our experts also provide guidance to those who are performing Umrah for the first time. As a result of our team's consistent efforts, we have been receiving encouraging feedback from our customers. You would certainly benefit from booking your December Umrah packages with us. Muslims residing in the UK enjoy a holiday season towards the end of December so they have a wonderful opportunity of performing their Umrah in this month. Our exclusive December Umrah package includes the best flights of the leading airlines and hotels located close to the Masjid al-Haram so that you can reach the holy mosque on time to complete the rituals of Umrah and return to your hotel room without any delays. By booking your December Umrah with us, you will not only be able to make a good use of your vacation but also save money if you book your Umrah packages well in advance. Owing to the lesser crowd and favourable climatic conditions, you would have absolutely no inconvenience in completing all the Umrah rituals. With our strategic pricing scheme of the December Umrah Packages, you can pick the one that perfectly suits your budget. You would get all the support from us for fulfilling your intention of Umrah with complete peace of mind. So, book your desired Umrah package for the month of December with I’timaar and get the best deals! Most reliable and trustworthy travel service provider in the UK, I’timaar offers exclusive Umrah deals for your December Umrah tour for the Muslims who want to travel to Makkah for this spiritual journey. We have special Umrah packages for December at slashed prices. Take advantage of the bargain deals on the occasion of Christmas and New Year holidays and book your Umrah packages at the lowest rates. On booking in advance with us, you can get fabulous deals on Umrah and reduce the overall cost of your journey. Talk to our Umrah experts now!